It's true that the ability to make Roth IRA contributions is phased out, or completely eliminated, if your modified adjusted gross income (MAGI) exceeds certain levels. For 2016, the phase-outs start at the amounts listed below. MAGI is the adjusted gross income (AGI) amount reported on the bottom of page one of your Form 1040 with certain add-backs that may or may not apply in your situation. The write-off for 50 percent of self-employment tax. At age 70 1/2, you must begin to take withdrawals from a traditional IRA or face steep penalties. But with a Roth IRA, you don't have to take withdrawals at any age, meaning the account can continue to grow tax free. Contributions can be made as long as you have earned income, no matter how old you are. 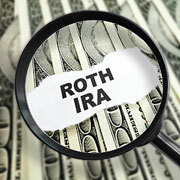 A Roth IRA can be passed on to your heirs, who can take tax-free withdrawals for decades if certain steps are taken.